mountain apartment, comfortable and functional, located in a small chalet near the center of the resort, quiet with pretty mountain views. excellent south east exposure of the terrace to enjoy the latter including in winter, and admire beautiful sunrises. very sunny region all year round. dynamic resort and family summer and winter. important ski area (vars-risoul) (cf application iphone) possibly accessible from the chalet (heaving required on 50 m because of a road to cross) .retour ski directly to the chalet. - summer: horse riding, tennis, heated swimming pool, mountain bike (mountain bike), paragliding, hiking, daily program of activities organized by the tourist office for children and adults. ideal region for hiking in the summer (maps and circuits available at the cottage). 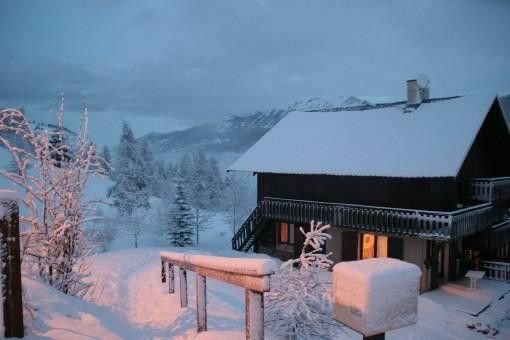 Mountain chalet located in the center of Vars claux near the center and shops and the French ski school (300m). Clear view of the mountain. Sunny terrace.